...mes by the law, it no longer comes by promise; but God gave it to Abraham by a promise" (Gal. 3:18). This inheritance includes the typical land of Canan, the promise of the Gospel (Gal. 3:8-9, 14). The Covenant of Grace/New Covenant being retroactive (influencing or applying to a period prior to enactment) had in it all the faithful before Christ (see for example Heb. 9:15; Rom. 3:25-26 about the retroactive aspect of the New Covenant) or see below. As to questions about covenant membership, people and the like, these will be discussed under the section for the New Covenant. 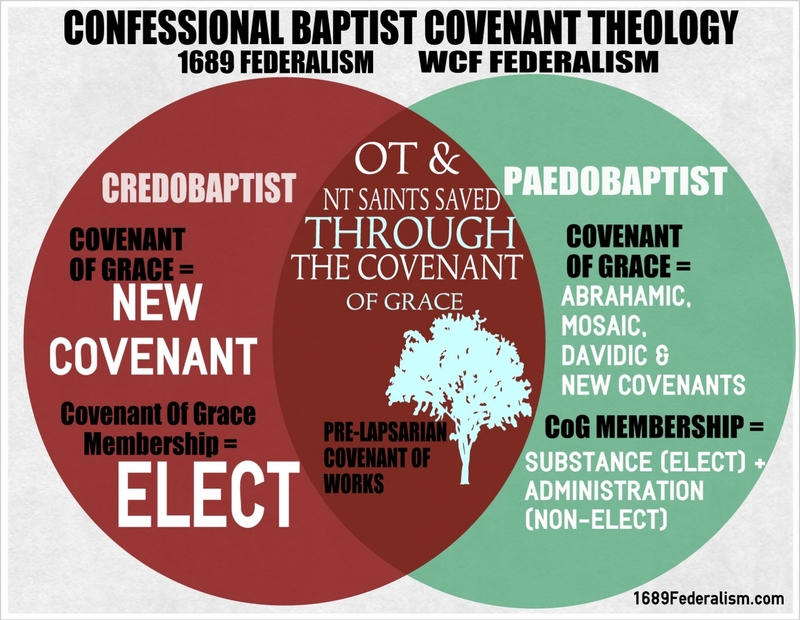 A very helpful diagram that I found which demonstrates the understanding of Covenant Theology from the perspective of a 1689 Federalist can be found here. The commonalities and differences between 1689 and Westminster Federalism may be illustrated by a helpful diagram which Brandon Adams has made for 1689Federalism.com. For many, when asking the question “which is the first covenant that the Bible mentions” the answer is the Noahic Covenant. In a way, this is understandable, since the first mention of the word “covenant” is found in Genesis 6:18, though I have argued for the Covenant of Works being the first covenant established in time above. The Lord was sorry that He made man on the earth and that man had become so wicked. The Lord wanted to blot out mankind which He had created as very good, but which has sought out many wicked and sinful ways away from God (Eccl. 7:29). ...http://www.pbministries.org/books/pink/Divine_Covenants/index.htm">online and that is how I collected these citations and corrected some typos and other minor errors. Just as the various Messianic prophecies, given by God at different times and at wide intervals, were suited to the local occasions when they were first made, so it was in the different renewals of His covenant of grace. Each of those renewals—unto Abraham, Moses, David and so forth—adumbrated some special feature of the everlasting covenant into which God had entered with the Mediator; but the immediate circumstances of each of those favored men molded, or gave form to, each particular feature of the eternal agreement which was severally shadowed forth unto them. They were all of them revelations of God’s gracious purpose, exhibited at first in an obscure form, but unfolding according to an obvious law of progress: each renewal adding something to what was previously known, so that the path of the just was as the shining light, which shone more and more unto the perfect day, when the shadows were displaced by the substance itself. .../em and rejection of these things? It does entail a denial of some aspects, but not an entire denial. Baptists reject that baptism functions as a seal of the Covenant of Grace, rather, it is the Holy Spirit who is named to be the seal on believers in the New Testament. The same is true for the Lord's Supper; it is not a seal of the New Covenant, but the Holy Spirit is the seal. But we do believe that the holy ordinances do function as signs of the New Covenant. In 1689 Federalist understanding, the Covenant of Grace is the New Covenant before it was formally established in in the blood of Christ. In contrast, in Westminster Federalism, the New Covenant is an administration of the Covenant of Grace. Westminster Federalism teaches that the Abrahamic, Mosaic, Davidic covenants were administrations of the Covenant of Grace. But the Covenant of Grace reaches its final administration and revelation in the New Covenant. But we, 1689 Federalists, deny this. We believe rather that the New Covenant/Covenant of Grace was revealed in these covenants and the blessings thereof given to the elect, but not because of the covenant they found themselves in, but because they believed the promise. We believe that the Covenant of Grace, prior to the cross, existed in promise form, and not an established covenant. As John Owen famously said, “Believers were saved under it [the Mosaic Covenant], but not by virtue of it. Sinners perished eternally under it, but by the curse of the original law of works.” See more on 1689 Federalism and the case for it in chapter 7. What do we actually mean by a sign and a seal? A sign is something visible which points to inward and spiritual realities. 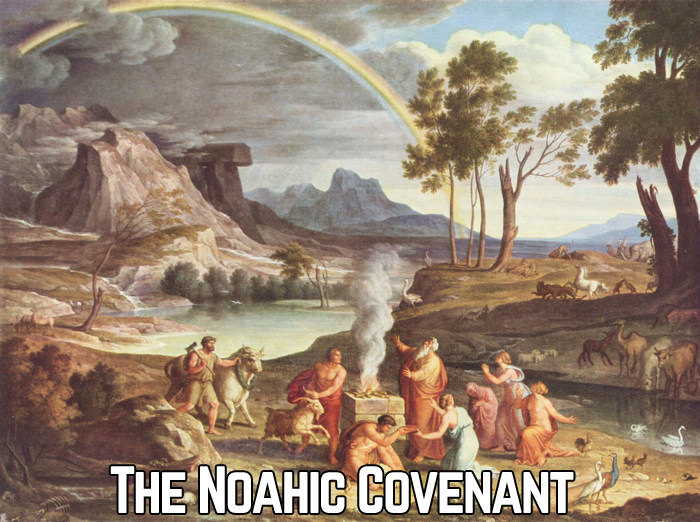 The rainbow was the visible sign of the Noahic Covenant, it functioned as a token (“Something serving as an indication, proof, or expression of something else”) that God will not destroy the earth by water again (Gen. 9:13-17). Circumcision functioned as a visible sign of the Abrahamic Covenant, which symbolized the need to be cleansed from sin through blood spilling. For Abraham, it was a sign and a seal of the faith which he had prior to circumcision (Rom. 4:11). The Sabbath functioned as a visible sign of the Mosaic Covenant. It functioned as a sign that God had set His people apart (Ex. 31:12-17; Ezek. 20:12, 20). There is no sign mentioned in connection with the Davidic or the New Covenant explicitly. But the throne would probably fit as a visible sign for David that he will always have someone from his posterity to sit on it and rule over Israel. As for the New Covenant, we only have two “positive and sovereign institution[s]” (1689 28:1). I admit from the start that we have no text in the New Testament identifying baptism or the Lord's Supper either as a sign individually, or signs together of the New Covenant. But does this then imply that we have no reason to see them as signs at all? Obviously not. We see them as signs of the New Covenant when we understand what a sign or a token is. ... we should pray for the churches of Christ that they stand uncompromised on His Word and His authority, not fearing man but fearing God. ...Daniel. There was no discussion of Antiochus Epiphanes IV, as if he had nothing to do with Daniel. He takes a futuristic approach and departs from the traditional First Advent Interpretation of Daniel 9:24-27 to a radical interpretation. He takes a blended prophecy approach to the Olivet Discourse. Believers that most of the signs did indeed occur in the first century, but lays very little stress on those. Insists that Matthew 24:29-31 is referring to the visible Parousia of our Lord, but I believe that Sam Storms made a very compelling case (at least for me) for the partial-preterist interpretation of Matt 24:1-35. Fun and eschatologically irrelevant disagreement is his Westminster Federalism on the covenants, haha. This is a great work, definitely a comprehensive book on eschatology going head to head with the difficult passages used to argue for premillennialism and offering an amillennial interpretation which Christ and Church centered and within the two-staged Kingdom model. I have learned many things and I will no doubt be going back to the book and re-reading and re-checking some portions. Go get it for yourself, I believe you will be challenged in your views. ^ Kingdom Come: The Amillennial Alternative, pages 451-465.